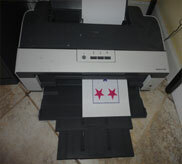 Impress visitors to your home as your family coat-of-arms greets them at the door. 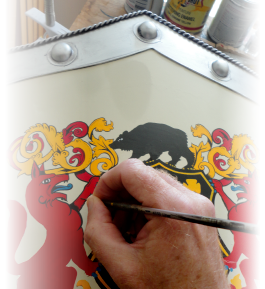 Doorknocker is hand-painted in durable oil-based enamels for weather-resistance and a lasting finish. Set your entryway apart from the rest with a doorknocker that celebrates the family history of its residents. 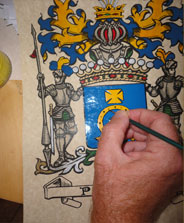 We carefully research your family surname for its authentic coat-of-arms, then hand-paint the coat-of-arms, using hand-painted calligraphy to record the family name above the arms. 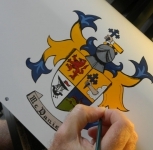 Simply provide the family surname at check out (and country of origin, if known), and we’ll do the rest, delivering your family coat-of-arms within three weeks (specify Brass finish or Aged Brass finish).